If you’re looking to curl up on your sofa with a new book, you may be interested in reading one of the popular books listed below. All of which are gripping, page-turners, which are sure to have you hooked within a single chapter! Despite “The Keeper of Lost Things” being author Ruth Hogan’s debut novel, it has obtained critical acclaim. The main character of “The Keeper of Lost Things” is Anthony Peardew, an elderly man who collects items which people have misplaced. Each time Anthony finds a lost, misplaced item, he takes it home and writes a story about it and the individual who may have lost it. As Anthony grows older, he entrusts his secret mission to his assistant Laura. Who is tasked with the monumental challenge of reuniting all of the misplaced items which he has rescued with their owners. On a seemingly normal school day, five high school students walk into a classroom to serve detention, however, only four students walk out of their detention session alive. After detectives declare that Simon’s death was not an accident, the remaining four students are all questioned as suspects in Simon’s death. The four suspects include Addy, the school’s reigning homecoming princess, Bronwyn a nerd who has been accepted into Yale, Cooper the school’s all-star baseball pitcher and Nate, who has been caught illegally dealing drugs. Did one of the four students kill Simon, the school outcast or are the four students mere scapegoats for an alternative killer? To find out it’s well worth reading “One of Us Is Lying”, which was written by Karen M. McManus. “Camino Island” was written by John Grisham, who is one of the most popular authors of his generation. The story follows Bruce Cable, an unlikely hero who owns a bookstore on Camino Island and makes a living by dealing in rare books. His secret being that he occasionally deals in stolen books. After a group of thieves manage to successfully steal 25 million dollars of rare books from in a vault which is located underneath Princeton University’s Firestone Library, a mysterious woman pays Mercer Mann, a young novelist to infiltrate Cable’s mysterious group of literary friends. Who may or may not be involved in the Firestone Library’s robbery! So if you’re looking to pick up a new book, you can’t go wrong choosing to pick up any of the four gripping books listed above. 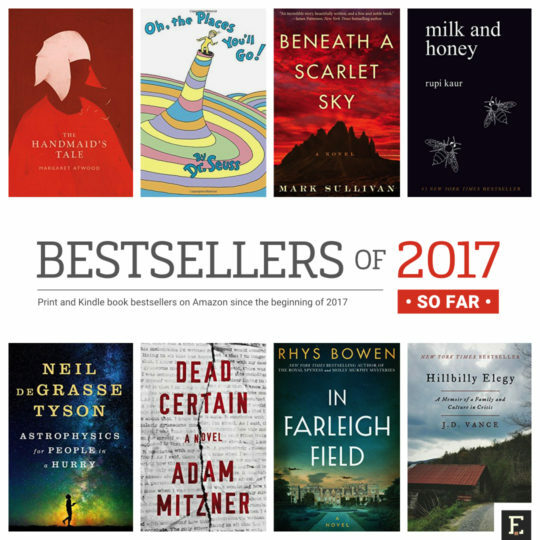 Each of which is one of the most popular books to be released in 2017. So if you’re looking to read a book which will capture your attention, it’s well worth picking up one of the books mentioned.